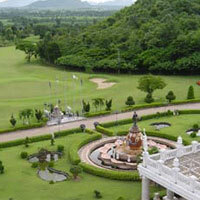 Pattaya Country Club & Resort located in the natural atmosphere of over 2,000 rai of Private land. Enjoy a round of golf on This standard 18- hole golf course. It's the only golf course to Highway No.331 and largest golf course in the area, including mini golf course for beginners with all the facilities you need, and It's just 15 km. to Pattaya and many attraction. The finishing 3 holes, locally named “amen corner” are the most difficult on the course and make for some dramatic finishes or surprise scores those counting too early on a good a round.